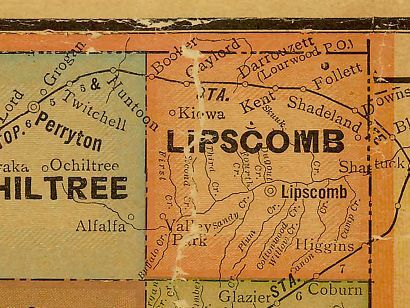 The Lipscomb County town of Booker actually started out as LaKemp, OK -- but as the saying goes, it got to Texas as soon as it could. 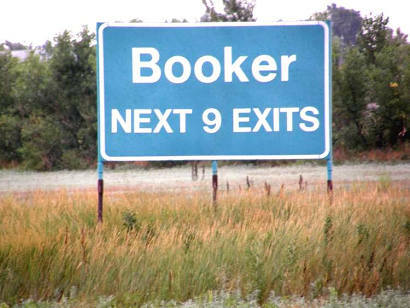 Texas’ northern-most community, Booker lies only three miles south of the Texas-Oklahoma border at the top of the Panhandle, but that’s seven miles farther south than it used to be when it was in Beaver County, Oklahoma. The change of address had nothing to do with its residents wanting to be Texans, however. They just wanted to live somewhere with a more promising future, no matter the location of their capital. And back then, a town’s prosperity had a lot to do with whether it enjoyed railroad service. Primarily on the belief that when the Santa Fe Railroad built a line from Shattuck, OK across the northern Panhandle, the rails would cut through newly organized Beaver County, developers platted a town site in 1909. The new town in the new state (Oklahoma had only gained statehood two years before) would be named for David L. Kemp, but when the application for a new post office hit Washington, the Post Office Department notified the townsite promoters that Oklahoma already had a Kemp City. So someone dressed up “Kemp” with a fancy-looking “La” and made it LaKemp. In addition to its new post office, LaKemp soon boasted a hotel, a boarding house, a general store, a bank, a café (albeit one in a tent), a barber shop, a blacksmith shop, a lumber yard, a livery stable, a drug store and other businesses. Within a year, the new town had its own newspaper, the LaKemp Mirror. For the next eight years, LaKemp enjoyed relative prosperity as a business center for farmers and ranchers, but when the Santa Fe finally began surveying its long-anticipated trackage eastward from Shattuck, it became apparent that the route would bypass LaKemp by considerably more than a country mile. In fact, the line would be built no nearer than seven miles from town. Not that the Santa Fe opposed civic development. On Aug. 2, 1917, railroad officials filed a plat with the Lipscomb County clerk for a new townsite in Texas to be named Booker in honor of B.F. Booker, an early day Santa Fe locating engineer. Additional residential lots were platted that December 10. Earlier that year, however, the United States had entered the war between Great Britain and Germany. That forced the Santa Fe to shut down construction after the new line reached Follett, a community 22 miles west of the planned town of Booker. With war’s end in November 1918, work on the tracks resumed early in 1919 and the first train rolled into Booker on the Fourth of July that year. Meanwhile, back in LaKemp, OK, most of its residents had already begun to move to Booker. They took their town with them, jacking up its frame houses and business buildings and hauling them by mule team to the new townsite in Texas. Crossing the open prairie, ten mules could pull a two-room house complete with brick chimney just fine. The town doctor, Ira T. Smith and his wife had been the first to make the move. Two brothers who had a real estate business in LaKemp, J.W. and O.C. Bell, were among the Okies who decided to become Texans. J.W. Bell served as LaKemp’s postmaster, and he had already written Washington asking permission to relocate the post office across the state line in the new town in Lipscomb County. As he patiently waited for an answer, he saw postal volume and business in general drying up faster than a playa lake in a drought. Deciding he couldn’t wait on Washington any longer, Bell hired a wagon and team and moved all the postal fixtures and supplies to Booker overnight. After handling mail in Booker for a full year, Bell finally got a letter from Washington approving the move. By that time, LaKemp had become a ghost town. Booker, on the other hand, flourished until the Dust Bowl days of the 1930s. Oil play in the 1950s and 1960s perked up business, and contrary to many rural towns in Texas, Booker actually gained population from 2000 to 2010, growing to 1,516 from 1,315 residents. Ironically enough, that growth spurt came without rail service. The Santa Fe had discontinued passenger service to Booker in the 1950s. And in 2006, its corporate successor, the Burlington Norther Santa Fe, dropped rail service altogether.